The tribute band is an interesting thing. I always wonder how it feels for the original band, to know that their music has inspired such a thing, but also that someone is out their performing their material, and probably not as well. And then I also wonder what the tribute band thinks; do they want to play their own material, but just know that wouldn’t draw a crowd? How does it feel to know that everyone in the crowd is, somewhere in their mind, pretending that they are the original band? I have loved Led Zeppelin since before I can remember. Obviously, I never got to see them…the closest I’ve come was seeing Robert Plant play a free show in Golden Gate park last year. I have always felt like their music knows the answer to some of life’s secrets. There’s a certain mystique about the band that has always drawn me in, and this has always been magnified by reading Pamela Des Barres’ books from an early age. Whenever I have conversations with people about what happens when you die, my vision has always been that I’ll have a private concert with every band I never got to see in their heyday. Zeppelin would be the headliners (followed by Nirvana, a Layne fronted Alice in Chains, The Doors, Jimi Hendrix, and Elvis). To me, Zeppelin represents an era that was a perfect combination of a lot of things. It seems like life was simpler back then, people were happier, and the world was just generally in a better place. I realize this may have not been the case for people who lived it, but my perceptions are my reality. There were great social movements taking place- the sexual revolution, women’s lib, civil rights- progress was happening in front of people’s eyes. And true creativity existed: Zeppelin was the first heavy metal band. A genre was defined. I feel like I live in a time where every thing has already been created, and now the only way to make something new is to combine things that already exist in new ways. This makes me sad. 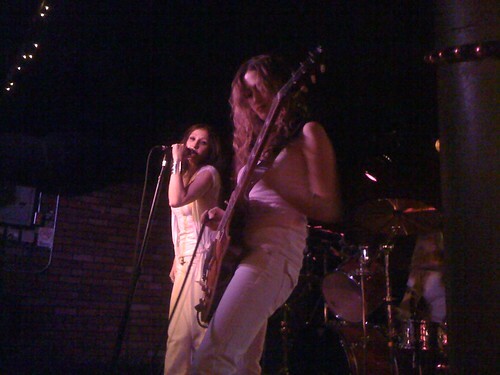 And that brings me to Zepparella: an all female tribute to Led Zeppelin. As far as tribute bands go, I would say that I find the all female ones most interesting. Rather then feeling like a sad imitation of the real thing, the all female aspect puts a spin on the concept that makes me feel better about being there. Bottom of the Hill is full of a different kind of concert-goer this evening; the average age is much higher, their expectations presumably different than a typical show. As if precisely timed, The Dave Rude Band takes the stage at that moment. Dave Rude is the current guitarist for the band Tesla, who you may or may not remember from the early ’90’s. Somewhat ironically, their most famous song was a cover of ‘Signs’. There is no doubt that Dave Rude is a very good guitar player; he plays effortlessly while executing tried and true rock star moves usually reserved for the big stage. 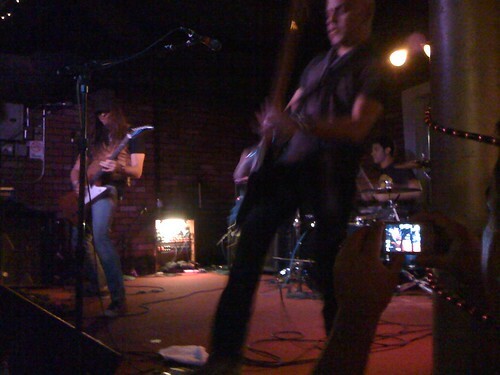 Their sound is straight from the ’90’s…which I can’t decide if that is a good or bad thing. It’s unfortunate that many bands that try to pull off a purist classic rock sound can end up sounding dated; as I said above, everything now is just a combination of things that already exist. The set felt really comfortable to listen to, though, because it sounded familiar (my friend, after every song, would say ‘Soul Asylum! Collective Soul! Faith No More!) I always enjoy watching a good guitarist work on a small stage like that, though. I was pleased. I was tripping out on the crowd- mostly older men- who lined the stage. One of them hopped up to sit on the speaker, breaking glasses in the process. Another guy was wearing a knit sweater with the American flag on the front and back. Yet another one had a Led Zeppelin shirt on. 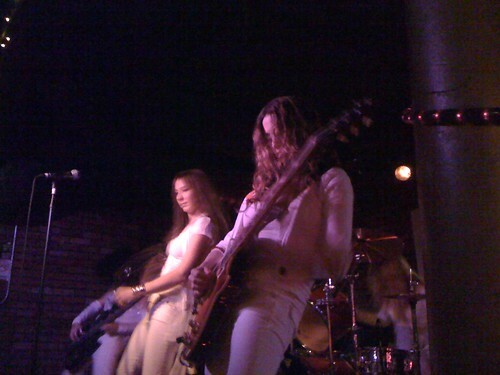 The girls come out on stage dressed in white. As they launched into their first cover, ‘The Lemon Song’, I’m struck by how well they pull this off, how seriously they take it, and how much fun it looks like they are having. The drummer plays with her eyes closed and a satisfied smile on her face; the guitarist exudes the same quiet confidence of Mr. Page himself; the bassist is a wide-stanced headbanger; and the singer is on point without sounding like she’s doing karaoke. Thanks to BOTH bartenders for making my vodka cran way more vodka than cran, I closed my eyes and thought about what it must have felt like to see Zeppelin live. The beginning of ‘When the Levee Breaks’, where the drum beat flows into the harmonica….to the intro lick to ‘Whole Lotta Love’…..to the bass line for ‘Dazed and Confused’….to the slow build that is ‘Kashmir’; these are some of the best songs ever written. And the fact that they can still make me feel the way they were probably intended to make people feel, forty years after they were written, in a tiny club in San Francisco, as played by four women, speaks volumes. I look at the crowd around me, and I imagine that some of them probably saw the real Zeppelin, probably at The Fillmore or Winterland. They have their eyes closed with a smile on their faces, probably recalling what it felt like to be there, in the summer of love. I’m extremely jealous. But who knows…if I make it to be 60, perhaps I’ll stand in a club one day, listening to an all female tribute to NIN, or Mastodon, or White Zombie, and I’ll close my eyes and reminisce. “Been Dazed and Confused for so long it’s not true. Wanted a woman, never bargained for you. Outside Lands/Sunday: Cage the Elephant – Atmosphere – The Dead Weather – M.I.A.